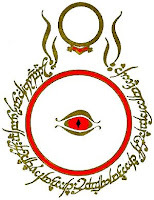 Tolkien explained that one of the reasons for writing Lord of the Rings was “the elucidation of truth and the encouragement of good morals in this real world, by the ancient device of exemplifying them in unfamiliar embodiments, that may tend to ‘bring them home.’” He understood that there is something edifying and encouraging and uplifting about seeing others follow truth. This, of course, is the whole point of Hebrews 11, to look back to the saints of old and see how they faithfully trusted the Lord. Why? So that we can say, “Since we are surrounded by so great a cloud of witnesses, let us also lay aside every weight, and sin which clings so closely, and let us run with endurance the race that is set before us.” (Heb 12:1). What Devin Brown does best in his new book, The Christian World of The Hobbit (Abingdon Press, 2012), is give his readers access. There is a subtly to Tolkien’s Middle-earth tales which makes them an enigma from the beginning. Brown offers several keys to The Hobbit’s mysteries, keys which open doors and give us entry into Tolkien’s hidden world, a world which is unabashedly Christian at its deepest foundations. The Hobbit is not an allegory of Christian truth, but a vision of the world. Christian themes nevertheless flow beneath Tolkien’s Middle-earth, and Brown focuses on three of them: providence, purpose and morality.